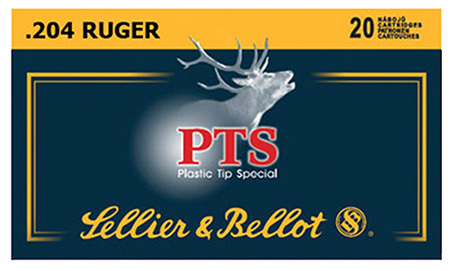 Sellier Bellot ammunition with the PTS Plastic Tip Special bullet is the result of efforts of hunting cartridge designers to develop a bullet with high wounding effects preserving concurrently excellent ballistic values. The bullet with lead core is covered with strengthening casing and furnished with polymer tip. Optimum shape enables the bullet to achieve higher speed and trajectory stability. These characteristics ensure excellent accuracy and wounding capability of the bullet that remains compact even at the moment of the strike it does not shatter and it does not impair game. Together with Sierra and Barnes bullets PTS bullets extend the range of rifle cartridges used for hunting and they extend possibilities of optimum choice for various kinds of use.